An Oakland landmark now serves classed-up meat and potatoes for the downtown office set. 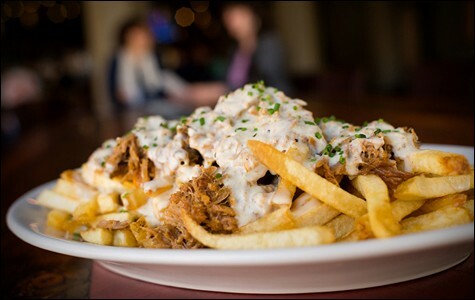 The Guilty Fries is a cross between poutine and lard fries. Hours: Mon.-Thu. 11:30 a.m.-10 p.m., Fri. 11:30 a.m.-11 p.m., Sat. 5-11 p.m. Happy hour at Tribune Tavern, the new restaurant on the first floor of the old Tribune Tower in downtown Oakland is, in a word, bananas: Well-dressed corporate types line up three or four deep in front of the bar, ordering craft cocktail after craft cocktail. In the main dining room, just about every table is occupied by a group of co-workers of some stripe, all sharing big platters of unapologetically meat-centric pub fare. It's loud and raucous and hard to walk around without knocking into someone's pitcher of margarita. All of which is to say, less than two months after opening, the restaurant already seems to have established itself as the go-to spot for the downtown Oakland after-work crowd. Chef Huw Thornton (SPQR, Locanda de Eva) has cooked Italian food for most of his career, but he said he's long been interested in the revival of old-timey British pub dishes, especially as interpreted through the lens of whole-animal cookery. So the menu features assorted sausages and shepherd's pie and updated versions of obscure (in the US) dishes like Welsh rarebit and Irish colcannon. For the devoted carnivore, the restaurant is a veritable wonderland: In the course of a single meal it's easy to dine on the flesh of five or six different animals — everything from dry-aged steaks to ox tongue to a whole rabbit, cooked down to a small kilner jar full of spreadable meat. If you were to fault the restaurant for anything, it'd be for lack of balance. If the half-dozen different permutations of meat and potatoes don't appeal to you, you can still eat well, but your options will be limited. And, a couple of salads notwithstanding, nearly every dish is "heavy" — fried or smothered in gravy or butter or some other animal fat. For vegetarians, the only entrée option is a cobbled-together plate of side dishes. Which isn't to say that the vegetable dishes weren't wonderful in their own right — but even these often included some meat component. A plate of grilled asparagus, for instance, was topped with cubes of quick-cured pancetta, a chopped-up hard-boiled egg, and a lemony green-garlic dressing. Still, this was excellent: Spring on a plate, with bacon. Your best bet is to stick mostly to the small plates and appetizers, where the chef's skill and creativity are the most evident. The grilled ox tongue was slowly braised, cut into a perfect rectangular block, and then seared, so that the meat ended up silky and unctuous. Topped with thin radish slices and a caper-y relish, this was one of the restaurant's more attractive dishes. Similarly, the pork trotter-and-cheek fritters were all about texture: the contrast of thick, crunchy batter and the tenderest parts of a pig, slow-cooked until creamy. The larger plates tended to be a bit less interesting, and worked better when ordered as shared plates rather than as traditional entrées. The bangers and mash featured two gigantic "spicy" pork sausages that were satisfyingly meaty, but not quite spicy (or otherwise compelling) enough to for me to want to finish the whole order myself. Thank goodness for the "mash" (the airiest mashed potatoes you could ask for, drenched in rich pork trotter gravy) and the sprinkling of English peas, which at least added a little bit of lightness to the plate. Meanwhile, the buttermilk fried chicken knocked it out of the park as far as crunch of batter was concerned, but an extra hit of spice (even just black pepper) would have gone a long way. 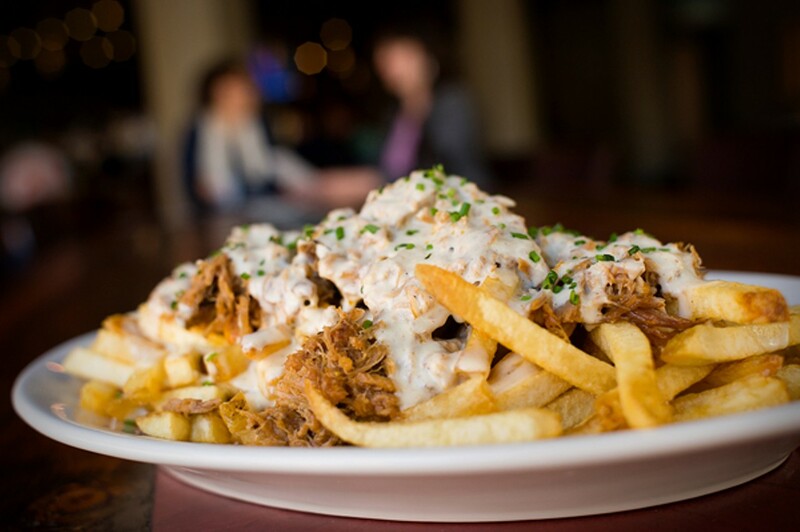 The Tavern's signature dish is probably the Guilty Fries: a huge plate of French fries topped with shredded pork shoulder that has been slow-roasted, carnitas-style, and a beer-and-cheese "fondue" gravy. The pork juices and fat soak into the potatoes, so you end up with a cross between poutine and good old-fashioned lard fries. As addictive as these were, God help the solo diner who tries to finish the entire portion. In the end, whatever you think of Tribune Tavern's food — which I loved, mostly — it's hard not to like the idea of the place and to be glad that it's open. Both Pastena and Thornton speak engagingly about Oakland's history during the early part of the 20th century, when the city was one of the biggest industrial hubs on the West Coast. Back then, the downtown area was full of bustling watering holes. A few probably served dishes like bangers and mash or shepherd's pie. Maybe, just maybe, you could have found a place that served the ice cream sundae known as knickerbocker glory for dessert — though probably none as delicate as Tribune Tavern's version, which has layers of whipped cream, boozy marinated cherries, and fresh strawberry gelatin. No, that's part of this moment in Oakland's history — this culinary renaissance, when even the stodgiest dishes are once again made relevant and new.